Many people were let in on the sheer beauty and majesty of New Zealand’s landscape after watching the “Lord of the Rings” trilogy, and while seeing it on the big screen provides a glimpse to what it has to offer, it really must be experienced in person. Soaring mountains, rugged coastlines, lakes, fjords, alpine glaciers, geysers, waterfalls, idyllic beaches, volcanoes and offshore islands are just some of the things that await visitors. It’s great for skiing, fishing, farming, bush walking and mountaineering – as well as especially thrilling adventures like bungee jumping, sky diving, caving, bridge climbing, jet boating, whitewater rafting and more. 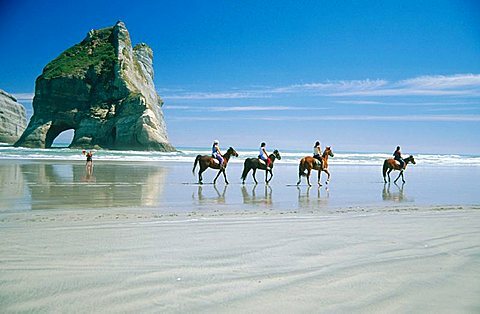 Golden Bay, nestled into the South Island’s northwest corner, offers a variety of diverse scenery, including gorgeous beaches like Wharariki Beach, home to picturesque rock arches. Captivating Milford Sound is a must to experience, located in the southwest region of the South Island. This fjord is part of the Te Wahipounamu World Heritage site as was called the “Eighth Wonder of the World” by Rudyard Kipling. Champagne Pool is a spectacular hot spring located within the Waiotapu geothermal area in the North Island of New Zealand. Its name if derived from the constant efflux of carbon dioxide gas, similar to a glass of bubbling champagne. The vibrant hues come from a rich deposition of minerals and silicate. The glowworm caves are known for their stalactite and stalagmite displays, and for the presence of glowworms. You’ll be mesmerized at the ceilings and walls lined with shimmering blue and green fairy lights while exploring the fascinating labyrinth on an inner tube, or via a boat trip, with only the glowworms to guide your way. New Zealand’s first national park, Tongariro encircles the volcanoes of Tongariro, Ruapehu and Ngauruhoe, offering some of the country’s most contrasting landscapes. It’s filled with surprises and extremes, including a diverse range of ecosystems that includes emerald lakes, hot springs, active volcanoes and alpine meadows as well as herb fields and desert-like plateaus. And that’s just a small glimpse at what New Zealand has to offer. Ready to pack?